Let’s review that number again: 1,200 horsepower. It gets there with the help of a 7,993 cc DOHC 64-valve intercooled W-16 engine with four turbochargers and a seven-speed, dual-clutch semi-automatic sequential transmission. Top speed? 258 mph. 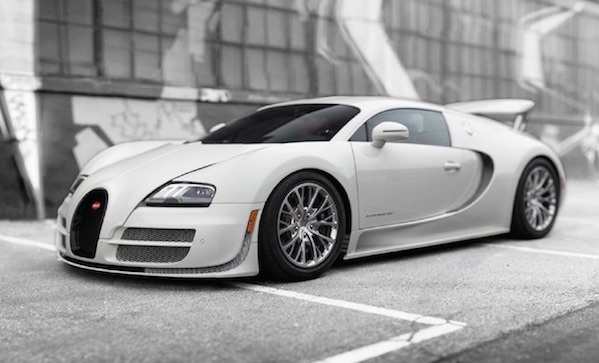 Oh, the 300 chassis (of 300) is one of only eight US-specification Veyron 16.4 Super Sports built. It’s also only gone 308 miles from new. Why? Well, at it’s top speed of 258 mph, it consumes 1.7 gallons of fuel a minute, which means it’ll run out of fuel in ten minutes. You’d also need a new set of tires if you did that—even though its special Michelin tires will last at 10,000 in normal driving conditions, they’ll only last fifteen minutes at 258 mph.